This past Saturday marked my one year blogiversary. 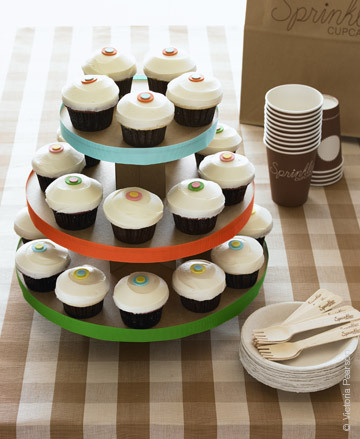 If I were to have a party I would love to try Sprinkles Cupcakes. I hear they are suppose to be the best and I do love a good cupcake. When I started this blog it was a way to get out my creative energy, to pursue other interests besides Curious George and coloring books while still being able to be that stay at home mom I so wanted to be. In the beginning I had no idea if I would have any readers, but now I do and I thank you for sharing in my random tidbits that bring me such great joy. This blog has brought me a few decorating clients and so many new friendships. I thank you for taking this journey through blogland with me. I really do feel blessed.